One Happy Island are an indiepop band from Boston who have just released their self-titled debut album throug Odd Box Records. I have to say it's a bit on the good side and I'm sure you'll be hearing a lot more from them on this site. Stellarium com from Singapore and this is one of three tracks they have contributed to a compilation album called "Decadence" which you can download for free from www.killredrocketrecords.bandcamp.com. Also featured on the compilation are tracks from Bloody Knives, Between The Cities Are Stars, Suicide Party and She Was A Vampire. A very nice version of the Joy Division classic. I'm Not A Band have promised they will deliver their debut album by the end of the year. This track is taken from the new Blackbird Blackbird E.P. "Let's Move On Together" which you can download in full along with all of their previous releases from their Bandcamp page HERE. 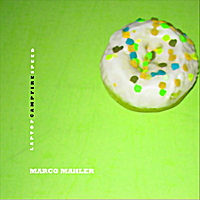 This track is taken from the long awaited (in my house at least) follow-up to Marco Mahler's debut album "Design In Quick Rotation" which was released back in 1997. The good news than is that the new album "Laptop Campfire Speed" is well worth the wait and contains a number of tracks which could well feature in your end of year lists. It will be available from all the usual outlets from 29th June. Bloody Knives are from Austin, Texas and first came to my attention just a couple of weeks ago when I heard the Killredrocketrecords compilation "Decadence" which features three of their tracks and can be downloaded for free from the Killredrocketrecords website. This then is the debut album by Bloody Knives and if you like A Place To Bury Strangers then you'll love it. It's called "Burn It All Down" and can be purchased as a limited edition of just 250 CD-R's complete with art book from HERE. This weeks release from the Bad Panda stable is a track from The Lucky Dip Escapade which consists of a bloke called Ollie Smith who lives in the Swedish city of Goteborg and to be honest that's about all I know. Good track though. Every week there is at least one record which comes through the letterbox, waits patiently to be heard and then proceeds to affect your life for a while. This week the culprit has turned out to be the debut album from Bradford based Laboratory Noise. It's called "When Sound Generates Light" and is available now on the bands own Recurring Accident label. As far as I can make out you have to go to the Laboratory Noise website HERE to order your copy. This track is taken from what I believe to be the debut release from Indonesian pop crafters Brilliant At Breakfast. "Almost Verbose" is a four track E.P. which can be downloaded for free from the February Records website. Blind Man's Colour come from St Petersburg, Florida and this track is taken from their "Wooden Blankets" E.P. which I believe was released back in February but it's new to me. Moments of pure loveliness. I particularly care for the last minute and a half. Hey, thanks for featuring our song on the podcast! Much appreciated.